What is the Wes Anderson style? Is it a mixture of vintage tchotchkes, droll repartee, and houndstooth? Well … yes, but there’s more to it than that, a lot of which has generally gone unnoticed. In this post, we break down the Wes Anderson style and all its components. In doing so, we’ll also help you define your own cinematic habits so that one day, film students can analyze and become overly possessive of your content. Wes Anderson grew up in Houston, Texas. He is the middle child of three boys. His parents divorced when he was eight years old. He attended St. James Preparatory high school before he moved to Austin, where he attended the University of Texas and graduated with a degree in philosophy. He made a short film, Bottle Rocket, which screened at Sundance in 1994, where it received little recognition by anyone other than producer Polly Platt. What is the Wes Anderson Style? Irrepressible nuance paired with a distinct lack of subtlety. Yes, it’s a complex sentence, but Wes Anderson is a complex dude. Wes Anderson is the most direct director in popular cinema today. He laces tons of nuance throughout his films, but much is executed in such a deliberate manner that you couldn’t miss it if you wanted to. Knows what he wants them to know. Sees what he wants them to see. Feels what he wants them to feel. The viewer gets to enjoy a sophisticated film that spoon-feeds information. His stories are undeniably fun, and he is one of the only working directors who can pull off massive tonal shifts throughout his films and scenes. Other directors like to keep you in suspense by holding information back, and strategically distributing details to the viewer when advantageous. Anderson willingly hands over information. He is succinct. He isn’t trying to trick you with his plot, and he has no intention of pulling the rug out from under you. He is more interested in being clear than anything else. Here are scenes from The Life Aquatic with Steve Zissou. The Wes Anderson style is Wes Anderson himself. A hard working, thoughtful human who is so focused on his own imagination that the troubles of the world around him are ancillary. His visuals are an extension of his own psychology. Anderson is those clothes, those record players, those memories. This is where many other directors fall short with their auteurist spirit. Wes Anderson films are unabashedly cinematic. You don’t have to like his movies to appreciate how he moves the camera, composes shots, and directs actors. He makes robust, thoughtful films that use every department to the fullest degree. He directs your attention to what he wants, when he wants, and he is a master at making each image count. Wes Anderson films are predominantly made from scratch. He can draw inspiration from books or other films, but he writes his own stories. His films hold a lot of information, feeling, and observation within a relatively simple narrative that is built by the artist that will eventually direct the picture. Other elements of his films seem to be made from scratch as well, like his costumes and production design. While other filmmakers use real life locations or designs to create a cohesive world, Anderson seems to build his outright. Even if he is using an established location, you get the feeling that the whole place was built for the film, and that is not done by accident. You rarely see product placement — at least not for a real product or brand — or anything else that compromises the integrity of the film. Nothing violates the unique world of Anderson's personal creation - except Adidas. Wes Anderson’s influences include Roman Polanski, Steven Spielberg, Alfred Hitchcock, Martin Scorsese, Waris Hussein, Ernst Lubitsch, Peter Bogdanovich, and French New Wave directors like François Truffaut and Jean-Luc Godard. Also, watch his films closely. There is a moment in The Grand Budapest Hotel that is an unabashed homage to a scene in the Alfred Hitchcock film Torn Curtain, as explained here by the Grand Budapest production designer Adam Stockhausen. This shows you just how much Anderson borrows from past filmmakers, and how he has a desire to retain some of those visuals and feeling he connected to as a young man. The Wes Anderson film style is his own personal style, and he has gone to great lengths to cultivate a unique approach to cinema. It is an amalgamation of books, films, experiences, and games that he created both as a child, and continues to create as an adult. Learning from Anderson is one of the most important things you can do as a filmmaker. Replicating his style? Well, that's one of the more questionable things you can do as a filmmaker. Even Wes Anderson and Quentin Tarantino knew that while they loved Godard, they couldn’t just rip off everything that made him unique. They studied why his style worked, and then blended it with all the other useful observations they made about film. A filmmaker's visual style can, and almost always does, emulate those who have come before. But memorable filmmakers develop their own trademark techniques and styles to become such - and Anderson is no exception. Wes Anderson felt that Bill Murray accepted his role in Rushmore because Anderson held his own during a discussion of the Kurosawa film, Red Beard. Anderson had not seen the film, but he was confident enough in his artistic vision that one of the biggest movie stars in the world decided to come on as a supporting role after reading the script and having a phone conversation. It was because Anderson had developed his own style, his own vision, and put it down on the page in a way that Murray says, he had never seen before. He had yet to make any of his famous stylized films with the pastel color palette or Adrien Brody, but Murray said “yes” to the young indie director from Austin. Wes Anderson tells stories from the perspective of a 12-year-old boy. More specifically, he tells stories from his perspective as a 12-year-old boy. His films capture the essence of a board game or story book, and the world he builds in each film consistently resembles a snapshot from his childhood. The melange of color palettes, costumes, set design, and technology all seem to create a world frozen in time somewhere around the early 1980s. Obviously, there is a lot to unpack here. Diverse audiences love Wes Anderson films for a multitude of reasons, some of which could be deemed "masculine." There is an undeniable sense that his films often are told from the perspective of a young man. His films aren’t particularly “macho” when compared to high octane thrillers or blow-em-away action flicks, but his main characters are predominantly straight men who have a sense of childish adventure that conflicts with their actual age. They shirk responsibility to maintain some warped sense of independence, but they soon realize that they are stronger with others, that they are better off when they are happy, and that the very thing that tortures them also grants them their unique spirit. Anderson proves that you can’t have one without the other. You can’t have the charm without the juvenile imagination. This recursive nature of Wes Anderson protagonists (arguably, we'll admit) doesn’t get old. What makes a Wes Anderson script? Wes Anderson scripts are completely finished when principal photography begins. He doesn’t limit his imagination for budget constraints. Anderson writes what he wants to write, and then finds a way to get it on film. The action is precise. He knows exactly how he wants to play out each scene. Anderson will double down on expository information. Anderson will show you the letter. His exposition is wonderful because it is so on-the-nose. Anderson has found a way to completely bypass the clunky presentation of essential information that so many other directors struggle with. He drives home the information so that the viewer can’t miss it. The scene below takes place on page 13 of a 120 page script. Screenwriters will know that this is roughly where you should have your inciting incident. We have the necessary information told to us by the manager. But then Anderson cuts to an insert of Royal (Gene Hackman) reading the actual letter, which confirms the information we've just learned. This obsessive control, and reiteration, of information is a trademark of Wes Anderson style. Check out this breakdown of how the screenplay for Moonrise Kingdom informs the visual style and execution of the finished film. Wes Anderson films are also funny. The director understands that good visual comedy comes from compromising situations or contradictions. In Anderson's films, often the darker the moments are in spirit, the funnier they are. Bill Murray has said that the script for Rushmore was “better than anything he had seen before” and “his writing was so perfect” that Murray decided to do the film for scale. They had never met, but Murray connected with the artistic vision because it was so well described by Anderson. Who are Wes Anderson characters? Wes Anderson characters have an absolutist world view, which is why they are so emotionally fragile and disappointed when the real world turns out differently than they had thought it to be. Sound like anyone familiar? A director we might be reading about right now, for example? These characters are often walking contradictions. Children act like adults. Adults act like children. Bill Murray in The Royal Tenenbaums plays a psychologist with a depressed wife and serious insecurities, and Jason Schwartzman in Rushmore is a boy genius who is failing his classes. Much of what makes Anderson such a relatable filmmaker is how he crafts characters who commonly act in ways most would deem inappropriate. His characters say and do awful things, and yet we are still pulling for them. Why? Because we know they human. How does Wes Anderson direct a film? Wes Anderson moves his films to an interesting rhythm. Many of his scenes contain long tracking shots with rapid-fire action, almost as if characters walking through scenes are little steel marbles rolling through a Rube Goldberg machine. Each action activates with the culmination of another. His transitions are very interesting, which is the trademark of any good director. You will find yourself moving through imagery quickly, but when you move onto the next scene the whole thing is completely static. Using sharp transitions like this creates comedy, but also generates a bit of emotional inertia. We are still reacting to the images from before while applying our emotional knowledge to new and seemingly unrelated visuals. Anderson also does cutaways that will, at times, break a scene in half. This is almost like a flashback, or a cutaway joke like a TV gag. It suggests a profound trust in his viewer to have some level of visual sophistication. He trusts his audience to make those emotional connections. Here is a video of BTS footage from The Grand Budapest Hotel. This video give you a bit of insight into the Wes Anderson style in practice on set. When watching behind-the-scenes footage of Anderson, you quickly find that he doesn’t always work out the creative beats of the scene with actors. Instead, Anderson is giving line readings or adjusting the action of a character on an idiosyncratic level. He can’t help it, nor should he. Line readings are a quick way to upset a professional actor, and they are generally considered a bit of a faux pas for directors. But Anderson isn’t a toe-the-line director. He doesn’t make films that the studio offers him, he brings projects that he created to producers and then makes them himself. It makes sense that his desire for control extends to every line of dialogue. Gene Hackman, Bill Murray, Ralph Fiennes — these are not humble actors excited to get their first big role. These are unequivocal movie stars. What the film looks like at the end is more important than making friends. That isn’t to say Anderson on set is a domineering taskmaster whipping actors like a pack of snow dogs. He gives everyone respect, never looks frazzled, and seems genuinely in love with making films. If you have a Wes Anderson level of idiosyncrasies in your film, you will be best served by having them written down so that you don’t forget a crucial ingredient in your visual recipe. Complicated Rube Goldberg machines require a blueprint for the marbles to roll smoothly, and so should your shoot. It's imperative to create a detailed shot list before you get to the set. Know in advance precisely what each shot will be. Creating a shot list with shot list software lets you put together your shots with a menu of clickable specs. You can become an instant "shot expert" by seeing the full list of options and testing different combinations. Long shot? Medium shot? Dolly? Pan? What about an aerial shot? Whatever works for each shot, go into your shoot with a solid game plan. When you do this during pre-production, you can find inconsistencies before you step on set. You'll have time to properly stage that wondrous ballet scene, right out of a Wes Anderson film. 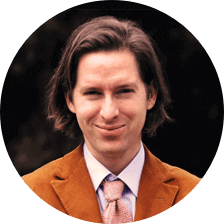 Wes Anderson is not a cinematographer; he is a screenwriter and director. Meet Robert Yeoman, one of the most prolific cinematographers working today. Yeoman has helped cement the visual template associated with Wes Anderson, so much so that Anderson has not worked with another cinematographer for any of his live-action feature films. Anderson and Yeoman often present images in symmetrical, flat compositions. This furthers the "storybook motif" that Anderson aims to create with his visuals. Viewers feel like they are moving through some sort of doll house world. This isn’t a world where reality forces you to compromise. The imagery in Wes Anderson films can be light and fluffy, but it's presented in a direct, succinct, and precise manner. This gives it style and weight. How does Wes Anderson use color? Wes Anderson uses a lot of different colors and combinations in his films, and each scene has a distinct, premeditated assembly of colors. The Wes Anderson color palette is every bit as intentional as his directing style. Color can elicit emotion from the audience, and the same colors can be connected to different emotions based on how you mix the colors, the surrounding imagery, and the general emotional tone of the scene. In the case above, the browns and oranges play into the somber feel of the scene, and more importantly they are consistent with the look of the overall film. The colors in The Royal Tenenbaums make sense for the era, location, and characters. In short, the colors lend themselves to, and help define, the complete world of the film. Other times the Wes Anderson color palette will call for bright, highly saturated colors. Take a look at any scene from The Grand Budapest Hotel. Wes Anderson uses his color palette to split time periods in Grand Budapest. Each era’s saturated colors represent the mood at the time, specifically with regard to the hotel itself. What are Wes Anderson costumes? Similar to a cartoon character, the viewer is able to associate a consistent look with a specific character. By doing this, the viewer forges a more significant relationship along with a set of expectations for each character. There is a certain psychological comfort that comes from knowing what a character is supposed to look like. It doesn’t mean every character has to wear an official uniform, but the costume becomes a uniform over time. If that costume happens to be a traditional uniform, so be it. Anderson's costume choices leave no room for imagination, mostly because Anderson has already taken up all the available real estate. He's being deliberate and removing all doubt. If we are supposed to think of William Dafoe’s character as creepy and menacing, as in The Grand Budapest Hotel, he shows up wearing black leather and brass knuckles. What if we are supposed to think of William Dafoe’s character differently, say... as a goofy sidekick? In The Life Aquatic, he shows up in short shorts and a goofy-looking beanie with a puffball on top. Also, the crew members of the research vessel Belafonte wear the same orange hats, but the characters tie the hats differently. It is a small detail, some might even say a relentless detail, but it is yet another example of how three characters can ostensibly wear the same article of clothing. The manner in how they wear it says oodles. What is the Wes Anderson font? Wes Anderson commonly uses the Futura and Helvetica fonts for his title cards. He has also been known to use Tilda and Didot as well. These fonts match the Wes Anderson style in that they are simple, stark, and direct. Even the Tilda font, which has a bit more flourish than the others, conveys an old-fashioned high-class sort of stability. This consistency across his films either suggests that Anderson has a premeditated desire to maintain his auteur label, or he just really likes those fonts... a lot. One of the really unique things about Wes Anderson and his style comes from the fact that we even notice his fonts. This is because he constantly uses text throughout his films. Why does Anderson make us read so much? Does he just want to flaunt his fonts? It goes deeper than that. Anderson knows that forcing a viewer to read even small bits of information will forge a more significant bond with that information. You often remember what you read. It's another way of conveying details about the story and the world. Text tickles a different part of the brain, and the Wes Anderson style fires on all cylinders. Text allows him to be direct and succinct. Otherwise, Anderson would run the risk that his important information might be missed or ignored. A well-designed and well-written title card can be a lot more effective than a clunky expository scene or a "Fred the Explainer" monologue. Now you understand more about Wes Anderson and his unique style. You've no doubt already started to realign the way you think about color in your films. It's time to gather tools to evoke specific emotions from your viewers. In our next post, you'll find out how to use color. Develop your style and define your visuals by studying movie color palettes to figure out your own techniques.